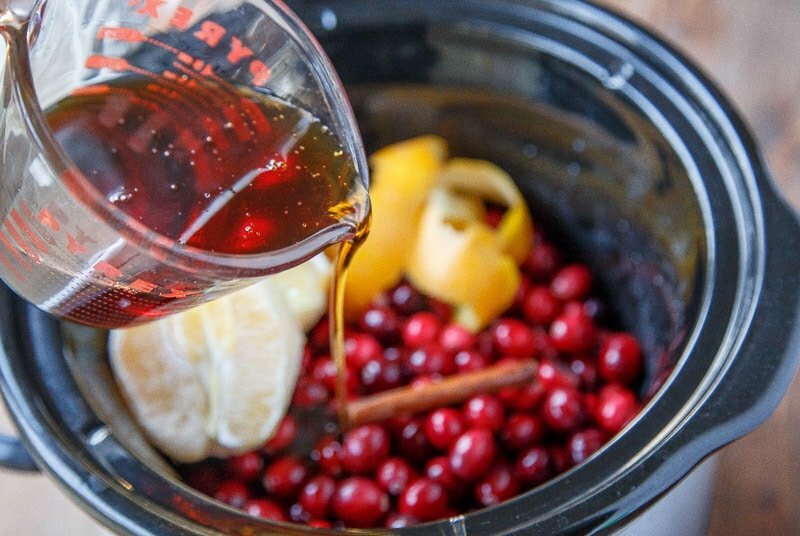 Crockpot cranberry sauce, small batch style! Welcome to the second-only recipe using a slow cooker on this site! You didn’t miss my first one, Creme Brûlée in the Slow Cooker, did you? Because that would be sad. 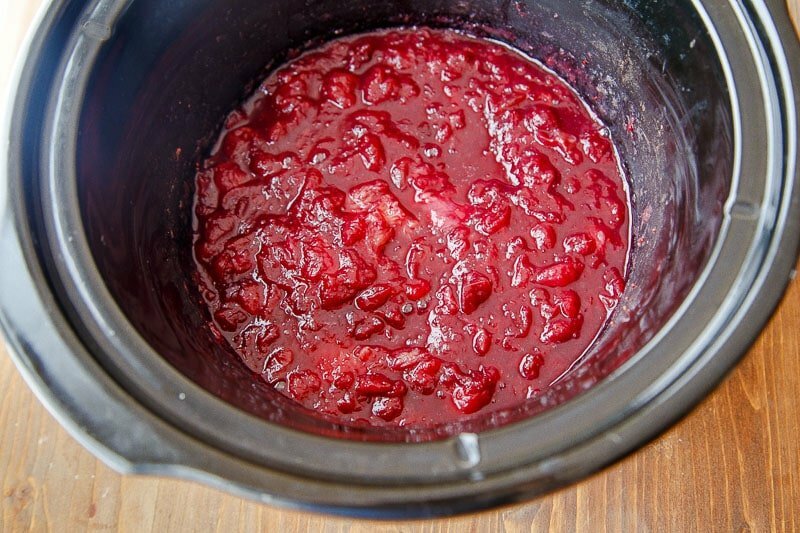 So, I love this crockpot cranberry sauce for a few reasons. One: using the slow cooker is hands-off Turkey Day. Two: it’s so dang easy, your drunk uncle could make it. Three: it has many uses! 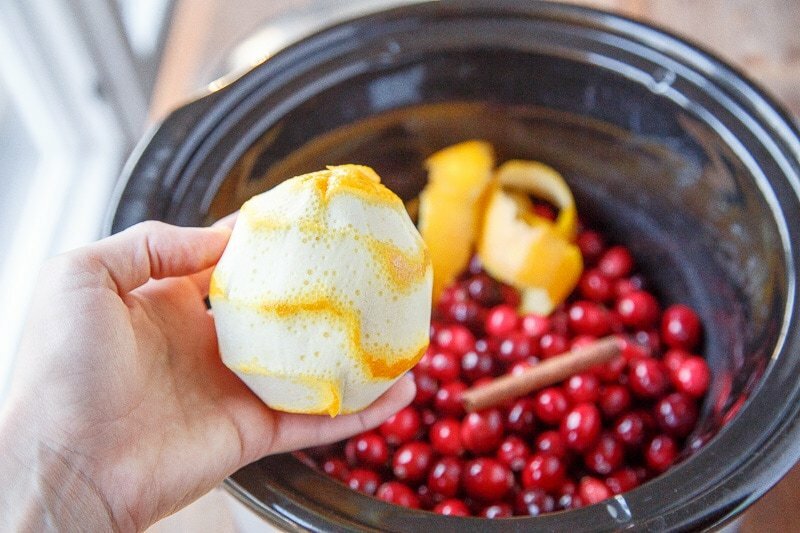 I want to see this cranberry butter snuggling up next to your sliced turkey. I also want to see a pretty little pot of it on your Thanksgiving day appetizer cheese board. Make it once, use it twice! 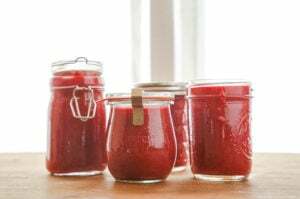 I actually made a double batch of this crockpot cranberry sauce with two bags of cranberries because my neighbor dropped off some plum jelly and I wanted to give her a little mason jar full of love as a thank you. Sometimes, the Dessert for Two world is lonely because my desserts don’t make a ton of leftovers to share with everyone. Every now and then, I make a giant batch dessert recipe (usually something I pinned here), and share with everyone. But most of the time, my mini desserts get eaten right out of the oven by me and mine. All that to say: while sometimes I wish I had leftover dessert to share, I also don’t want to be the reason anyone has to go to the gym. I’m going to cut that short right there and catch myself before I start to ramble about how much I hate to exercise. We do not talk of such things like ‘exercise’ as Turkey Day approaches. We actually don’t speak of things called ‘calories’ until well after the New Year. Well, well after. 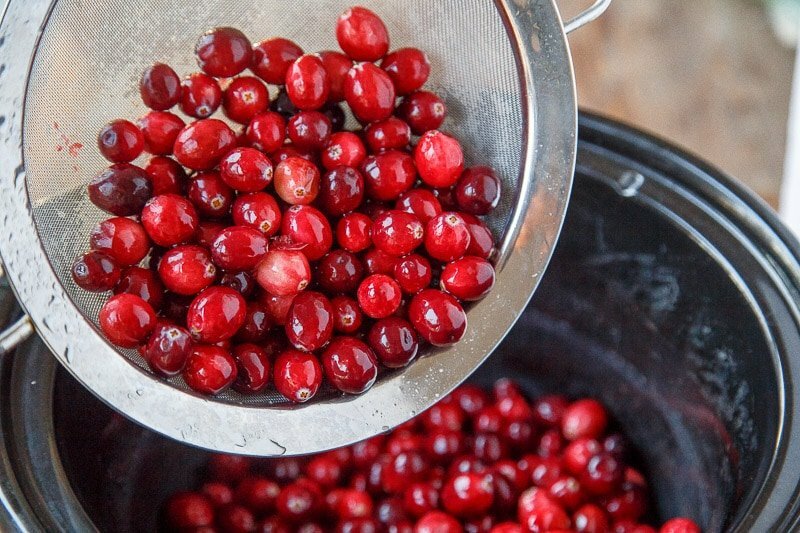 Wash the cranberries and pour them in the slow cooker. Next, get all fancy and peel all the zest off an orange, and add it to the slow cooker. Peel the orange and add it to the slow cooker, too. No need to chop it; it will break down while it cooks. Toss in a cinnamon stick, too. Next, add 1 cup of water and 1 1/2 cups of maple syrup. The flavor combo of maple, orange, cinnamon and cranberry is mind-blowing. Stir, and cook on low for 4-6 hours. Now grab that immersion blender thingie you had in the bottom drawer. (If you don’t have one, transfer the contents to a blender. Wait! Be sure to remove the orange peel and cinnamon stick first. Phew! That was close. Then, drizzle it over sliced turkey, and scoop it up for your cheese tray. We have just a few more savory recipes for our small Thanksgiving, and then it’s onto dessert, baby. Sorry I called you baby. 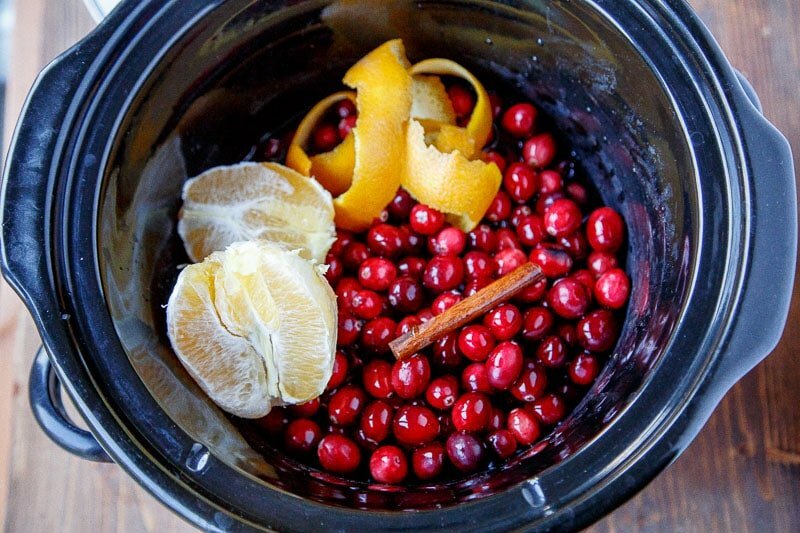 First, rinse the cranberries and add them to the slow cooker. Use a vegetable peeler to peel off all of the zest from the orange. Be careful not get the white pith. Add it to the slow cooker. Peel the orange and add it to the slow cooker. Add the cinnamon stick, maple syrup, and water. Remove the cinnamon stick and orange peel. 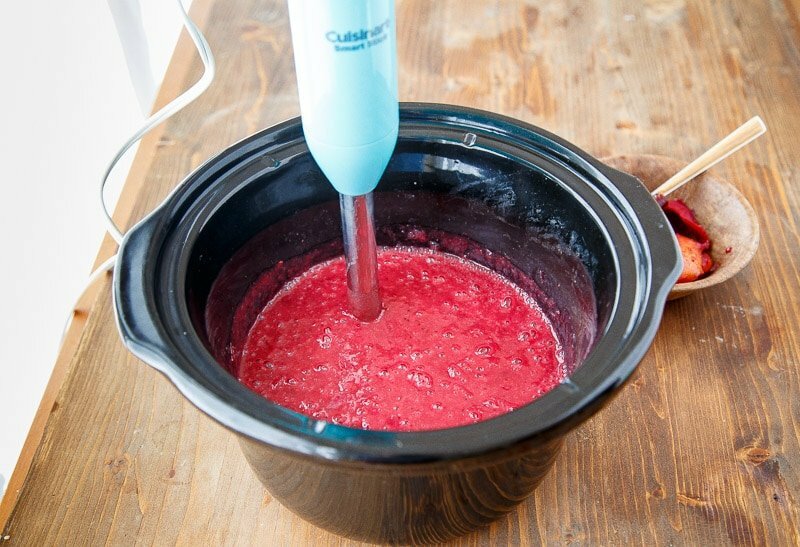 Using an immersion blender (or regular blender), puree the contents of the slow cooker. 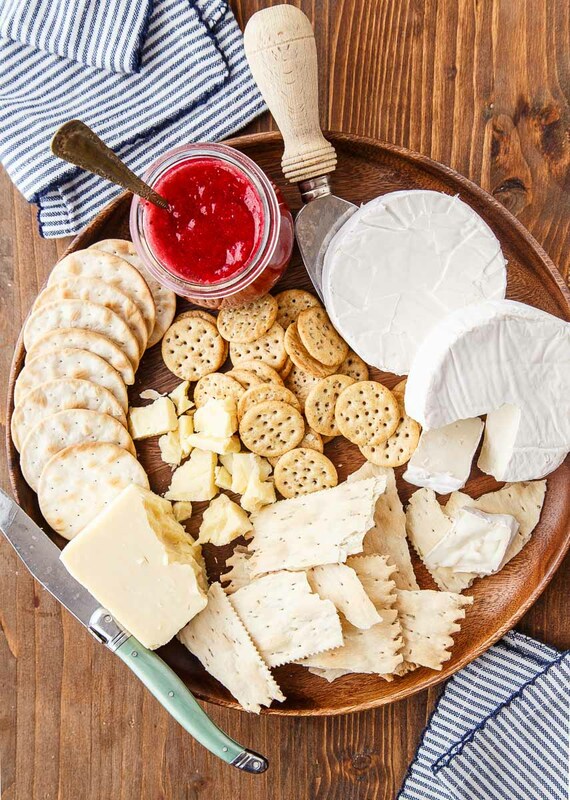 Serve with sliced turkey or on a cheese tray. This looks absolutely fabulous. I was confused at first with the word butter in the title, but this is sauce. This will definitely be on one of my holiday menus! 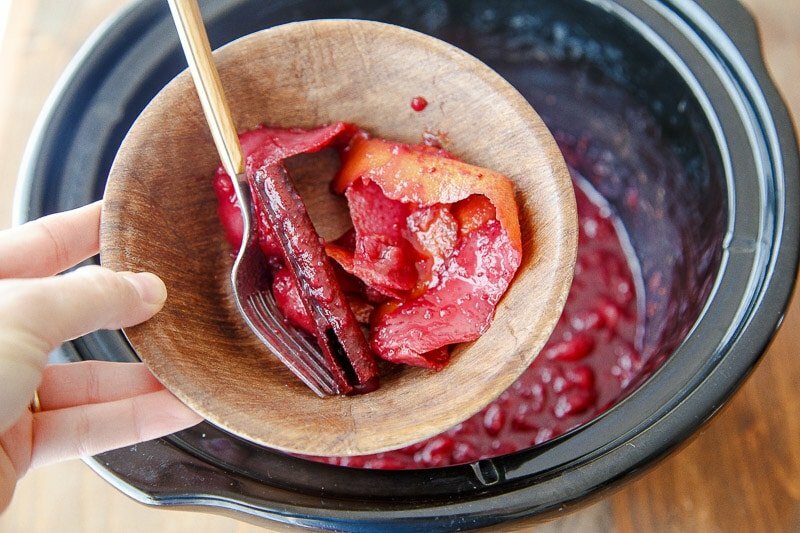 I love that you made this cranberry butter in the slow cooker!!! and that last photo of the bite is perfection! Goat Brie, amazing! It’s almost too easy for Thanksgiving! Do we have to ‘out’ ourselves? Looks luscious and I like what you’re saying, that it is on the tangy side, since you no doubt have something sweet for us to end the meal with. Thank-you for simplifying! How long will the cranberry butter last in the fridge? Does this come out runny or kind of more set up like a jam? Can this be hot water bath canned? I would love to water bath this recipe too. Can it be done? If so how long for 1/2 pints and pints? Loving this! I’m always in charge of the cranberry sauce and I’ve been making a cranberry-blueberry thing for years. Excited to try something new this year – definitely going to whip up a batch (or two!) of this cranberry butter! That’s so funny: this is how I make cranberry sauce! I couldn’t figure out what cranberry butter is, but it must just be a regional dialect thing. Anyway, looks delish! Cranberry butter….ya know, like apple butter, but with cranberries. I make the “butter” with lots of different fruits. Pumpkin and peach are probably my favs! 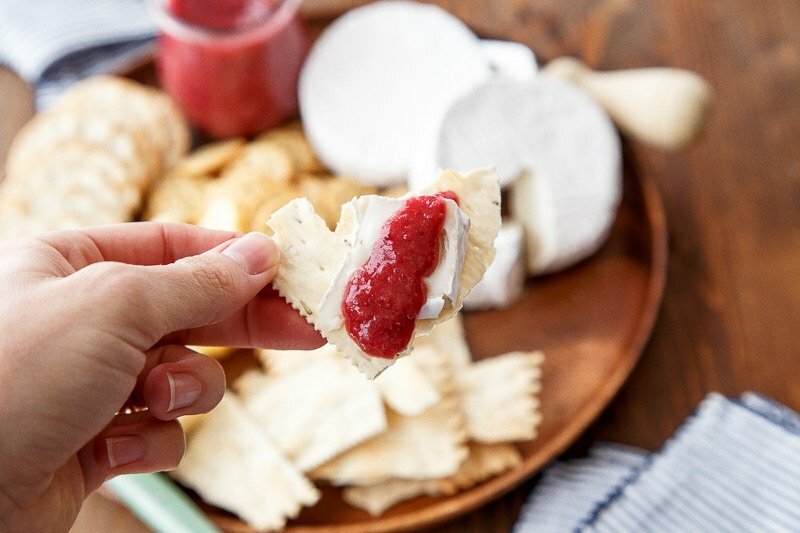 This sounds great, an appetizer with goat cheese and crackers. Definitely going in my recipe box. Thank you. Made this for Thanksgiving appetizer with cheese. A BIG hit!! Pureed it after 5 hours and had to cook a few more hours to thicken to where I wanted it. No big deal as this is so good; using it in sandwiches the rest of the week! I never really liked cranberry relish, but this updated version seems like one you could appreciate. Thanks for this great idea. I haven’t tried it, but I’m sure if you followed proper canning instructions to ensure food safety! Can we add sure jel to it to make it thicker? What is grade b syrup? How long will this butter last if you put it in air tight mason jars? What’s the best method to store this? I’m loving this! Just shared on my blog’s FB page too! Have a wonderful Thanksgiving! I am sure you can, but what about subbing the syrup for sugar or Palm sugar, if you do not want the maple flavor? this stuff is fantastic! Just made my second batch of the season. Definitely addictive. I made the first batch on the stovetop in a Dutch oven and let it simmer for two hours. Today I used my rice cooker and set it on White Rice. At the end of that 45-minute cycle, I did Brown Rice (35 mins) and then let it simmer for another 15 or so to make sure it was thickened. Seems to be the right consistency, and it tastes fabulous. I used three cinnamon sticks for this batch. ???? love i t …. Can i put it in jars and freeze it or does it have to be used within two weeks and not frozen. I haven’t tried to freeze it, but I’m sure it would work. can you substitute sugar for the syrup? awww, bummer, Catherine! Do you know why? Is it because it’s naturally sweetened so it’s not as sweet as commercial cranberry products? You could try adding more maple syrup to increase the sweetness and then stir it into yogurt? What kind of Maple Syrup? I wonder if you could hot water bath this sauce and keep it shelf safe? I made this exactly following the instructions and it’s super runny! What should I do to thicken it up to more of a buttery/spread like consistency?? Help! Making this for gifts for family members for Christmas! I make apple butter in the crockpot. Never thought about cranberry butter. But I am looking forward to making this. I haven’t tried it, but google canning instructions for cranberries/ acidic foods. This has earned a permanent spot on our Thanksgiving table. It’s in the crock pot right now, as I am making it for the second year in a row. I’m even planning on making a second batch to put in jars and gift! And this is coming from someone who has never liked cranberry sauce. This recipe is a solid home run! Just made this and it is DELICIOUS! I added ginger for a little extra zing. But if you make this you will DEFINITELY want to strain it after you blend it and before you pour it into your jar/container… the cranberry skins make for a weird texture, even if you have a great blender. Strain and you will be fine though! Loving this stuff! Can’t wait to serve this jewel colored butter at our Christmas gathering. Thanks!